Yoo In Na gave Yang Se Hyung some dating advice on 'Blind Date Cafe'! 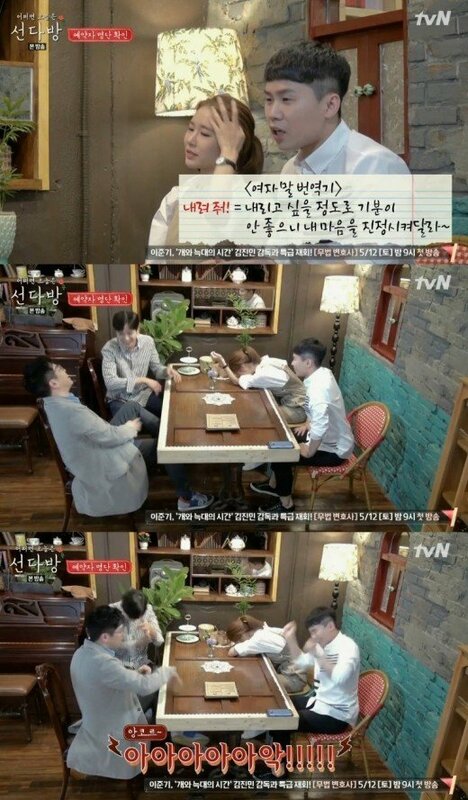 On the April 29th episode of the tvN variety show, Yoo In Na and Yang Se Hyung talked about the common rules of dating. What Yang Se Hyung found most difficult was not knowing what woman mean when they say certain things during fights. With one example, he said: "What do I do when we are arguing as we drive, and the woman tells me to stop the car so she could leave? Do I really stop the car?" To his question, Yoo In Na explained, in her own way: "That means, 'Please calm me down enough, so that I don't feel the need to say that'." Since 'Blind Date Cafe' is a variety show that arranges blind dates for non-celebrities, the cast members often try to figure out for themselves what it means to date properly. In this episode, Yoo In Na and Yang Se Hyung also tried to mimic the body language of a couple on their first date, to guess what each sign could mean. Do you agree with Yoo In Na's response? Watch the video above and catch Yoo In Na and Yang Se Hyung try out a mock dating scene!